This post is sponsored by La Terra Fina. Thank you for supporting the brands that keep The Kitchen Paper alive! Hi again! 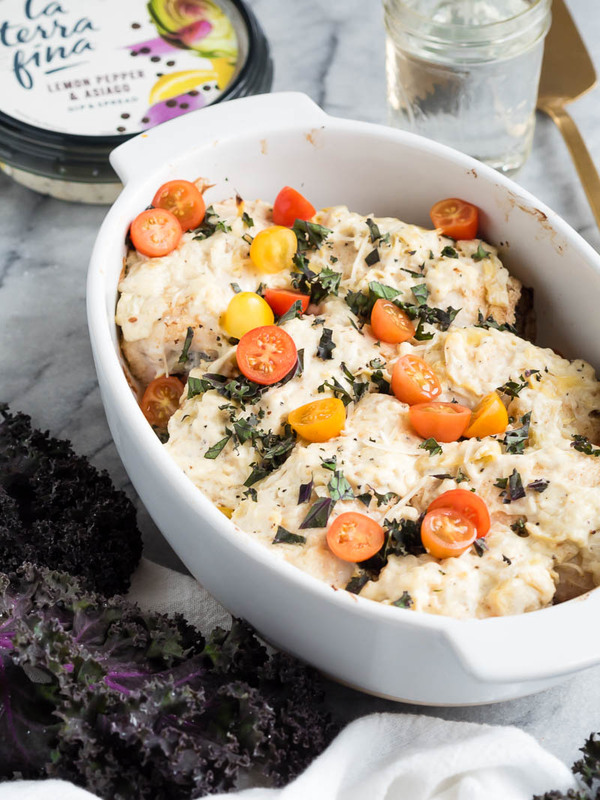 I’m back with a “we need a quick delicious cheesy chicken dinner” solution for ya. Plus kale, because you know me. This is my last post in a series of posts with La Terra Fina, and all of them have pointed out to me how easy it is to throw a super tasty dish together with real ingredients and minimal work. They use such great ingredients in their dips and spreads, so why not take advantage of it? I’m all for it. We’ll talk more about chicken in a moment! First, little life update again! As I mentioned last week: we are selling/buying houses at the moment. Selling one. Buying one. Gotta be specific, I guess. Anyways: we were supposed to close on selling yesterday, and close on buying today … but then it snowed and Portland shut down (as it does in the snow), and the county offices closed and wouldn’t record the sale. Ha! How’s that for a foiled plan!? Not a huge deal, apparently: the money is still all good to go, nobody can back out (everything is signed), it just pushes it back day. Our closing today should still happen on time, assuming offices are open. I’m posting this way before anyone makes those kinds of decisions, so who knows. Fingers crossed we can get the keys tonight and go celebrate in an empty house! And then finish packing. And wait for the movers to come tomorrow morning. I tell ya, I am ready for this busy busy house ordeal to be done. Back to chicken? Back to chicken. 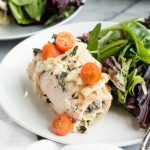 This recipe really is ridiculously simple: take some thick chicken breasts, and cut them into cutlets — in half horizontally, so you have two wide, flat pieces. 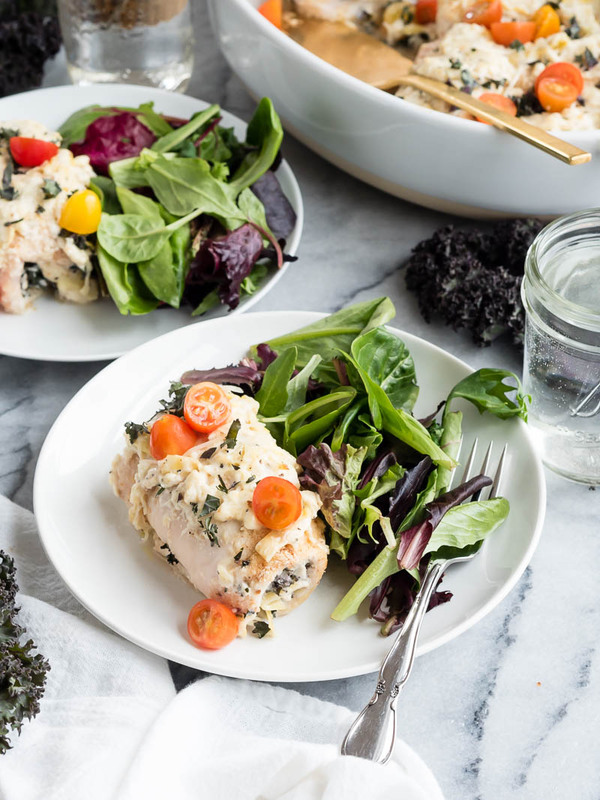 Mix the La Terra Fina Lemon Pepper & Asiago Dip & Spread with finely chopped kale, then use your hands to put a dollop in the middle of each chicken cutlet. Roll it up, then roll it in breadcrumbs, then put it in a baking dish and BAKE! About 10 minutes before the chicken is done, add more lemon pepper & asiago dip (no kale this time) on top of the chicken. Bake it! Garnish it! Enjoy it! It’s so darn easy. Also, this would work with almost any other flavor of La Terra Fina dips & spreads. Spinach artichoke & parm? or Italian style tomato and cheese? There are so many! 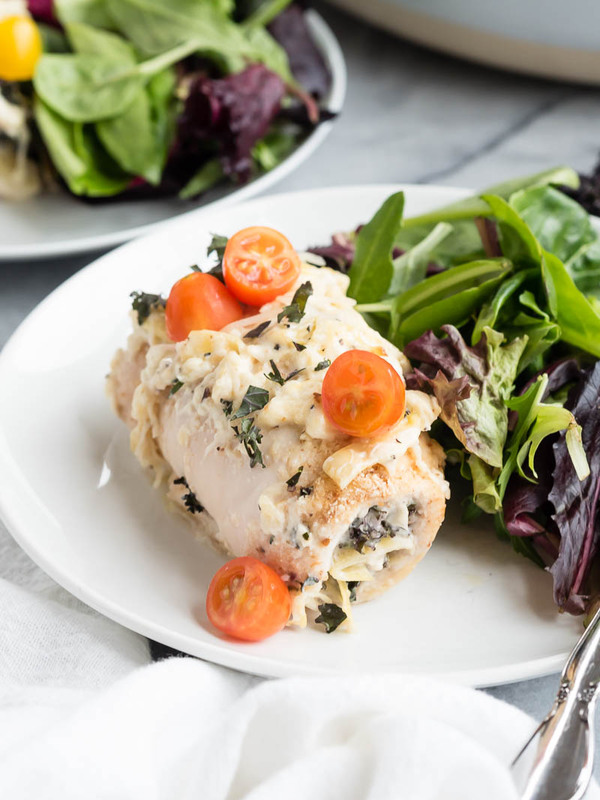 This quick chicken dinner uses lemon pepper & asiago dip to speed things up in the kitchen. 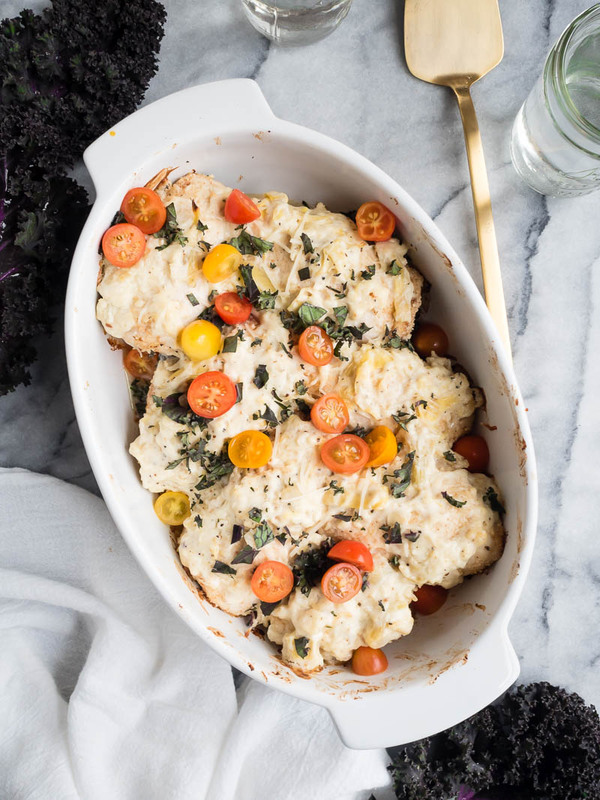 With added kale and tomatoes, it’s a balanced dinner for the whole family! Preheat the oven to 400F and gently coat the inside of a medium-sized (8″x8″ is fine) baking dish with olive oil. Place a chicken breast on a cutting board, and press your palm flat on top of it. Using a very sharp knife, cut horizontally through the chicken breast so you have two wide, flat pieces. Repeat with all of the chicken, lightly salt & pepper both sides of all pieces, then set aside. Mix half of the La Terra Fina Lemon Pepper & Asiago Dip & Spread with the kale. Pour the breadcrumbs into a shallow bowl or plate, and set aside. Using a spoon, or your fingers, put 1 Tbsp (roughly) of the dip and kale mixture in the center of each chicken cutlet, going from one edge to the other (the short way). Fold the long ends of each chicken cutlet over the filling, essentially “rolling” it into a little bundle. Holding it closed, dip it in the bread crumbs until the outside is coated. Place seam-side-down in the prepared dish. Repeat with all of the chicken, then bake the entire dish for 25 minutes. After 25 minutes, spread the remaining lemon pepper & asiago dip and sprinkle the shredded asiago over the top of the chicken evenly. Bake for another 10 minutes, or until the chicken is done. Garnish with cherry tomatoes and extra chopped kale! While I do enjoy many of your recipes, it is difficult when you use ingredients that aren’t available where I live. I realize you’re getting paid to use certain products in your recipes, and that’s ok, you need to earn a living, but it is frustrating. I’m sorry you’re frustrated, Shirley. La Terra Fina is available in Canada, FYI!